Wet strength resins are the most expensive chemical application in tissue production. Hence the urgent need for economically effective solutions to reduce consumption. Kemira’s Vladimir Grigoriev and Eric Padovani discuss. A TWM report. Wet strength in tissue and towel products is traditionally achieved by using relatively high dosages of a wet strength resin (WSR). This puts substantial pressure on the tissue maker’s profitability both due to high chemical cost and due to negative effects from WSR on machine runnability such as foaming, felt deposits and reduced dewatering. In recent years, tissue makers have also been under pressure to reduce the AOX levels in their effluent, to which WSR can be a significant contributor. Thus, there is an acute need for economically effective solutions for reducing the WSR consumption. Kemira has developed innovative chemical solutions to provide economic and environmental advantages in the production of wet strengthened paper grades. Among them are high efficiency FennoStrength resins that generate target wet tensile at a 10-25% lower dosage compared to the market resins. Furthermore, WSR can be complemented by synthetic functional promoters, e.g. anionic FennoBond or cationic FennoBond, to improve WSR efficiency even further. In this paper, we present on these concepts and demonstrate their benefits using industrial case studies. WSR are critical for achieving desired quality targets for most tissue grades, such as towel, industrial wipes, facial tissue, hankies and napkins. The predominant WSR in the market is based on the polyamidoamineepichlorohydrin (PAE) chemistry. There are almost no practical alternatives to PAE resins, especially when it comes to permanent wet strength that can develop under pH-neutral or alkaline conditions [Ref 1]. For some grades, where temporary wet strength is acceptable, glyoxalatedpolyacrylamide (GPAM) chemistry can be a viable solution [Ref.2]. Otherwise, PAE resins still rule the wet strength world. In the current, highly competitive tissue market, quality and price must be balanced and profitability is always of great importance. In order to achieve high levels of wet strength, especially needed for towels, high WSR dosages are required, often reaching 30 kg/t (as received) or even more. The cost is generally 5-20 €/t or more thus making WSR the most expensive chemical application in tissue production. Consequently, the economics of wet- strengthened grades largely depend on the resin efficiency. In the past decade, the cost pressure in tissue production also comes from stricter regulations of chloro-organic materials, which are suspected carcinogens. The three commonly regulated materials found in PAE resins are 3-chloro-1,3-propandiol (CPD), 1,3-dichloro-2-propanol (DCP) and absorbable organic chlorine (AOX). The regulator’s concerns arise from migration of chloro-organic materials from the wet-strengthened paper to food or their discharge with waste water, potentially harming people and the environment. However, since the mid-1980s PAE chemistry has undergone a huge transformation with regard to much lower residual levels of chloro-organics. These developments are well reviewed [Ref 3]. Nowadays, very clean PAE resins are available, which are produced using highly sophisticated manufacturing processes. The existing resins in the market have different levels of CPD, DCP and AOX and are classified as generation (G) 1, 2, 2.5, 3 and 4. The higher the G-number, the cleaner the resin. In the EU countries, the G1 resins are not used anymore since they have to be labelled as toxic and carcinogenic. The predominant resins marketed in the EU for tissue and towel are G2 and G2.5; whereas, the G3 and G4 resins are primarily used in products designed for direct food contact, e.g. coffee filters or sausage casings. The cleaner resins are highly technical materials and tend to cost more. Therefore, the main drivers for selecting an optimal WSR are regulatory targets and the cost that have to be balanced out. The regulatory pressure on the bottom line continues to increase. The most recent restriction will be imposed by the EU Directive 2010/75/EU that comes into effect in 2018 and will reduce the AOX limit in effluent in the wetstrength paper production from 150 to 50 g/t of paper produced [Ref 4]. Furthermore, not only the governmental bodies police chloro-organics (e.g. FDA, BfR, EU Directives), but the industry self-regulates through ecolabelling (EU Flower, Nordic Swan) or requirements imposed by retailers. Many producers in the EU and elsewhere are looking for new solutions to stay compliant with more stringent requirements without significantly increasing the cost of their operation. In response to such changing pressures, Kemira has developed a number of cost saving and sustainable technologies for wet-strength tissue production. These include high efficiency and low AOX resins as well as complimentary functional promoters that further improve the efficiency of WSR. Higher efficiency helps not only use less resin and reduce the operating cost, but also reduce the level of AOX and other chloroorganics in tissue sheet and effluent. This paper reviews Kemira’s advanced solutions, which allow tissue makers to get more benefits by using less WSR. The obvious solution to reducing the cost of wet-strengthened tissue is to use less WSR, without jeopardising the sheet quality targets, for which Kemira offers high-performance Kemira FennoStrength® resins. Quite often, we see opportunities to reduce the resin dosage by around 10-15% and sometimes even by up to 25%. In Figure 2, the most recent industrial cases are summarised. Lower dosages allow for chemical savings as well as lower AOX in paper and effluent. Additional benefits can be achieved for machine runnability related to more balanced charge, such as a lower risk of deposits, felt plugging or excessive foam. Even with G2 resins, tissue makers might be able to reach their AOX targets if they select high-efficiency G2 resins, not to mention high efficiency means a reduced WSR consumption and a lower operating cost. However, in many cases tissue producers must still resort to cleaner G2.5 resins. A drawback of G2.5 resins is that they are generally more expensive to run. Not only is the product cost higher due to higher manufacturing costs, but their efficiency decreases in the post-cleaning process. To overcome this problem, Kemira has developed an improved manufacturing technology that allows production of a clean G2.5 resin without a loss of efficiency. 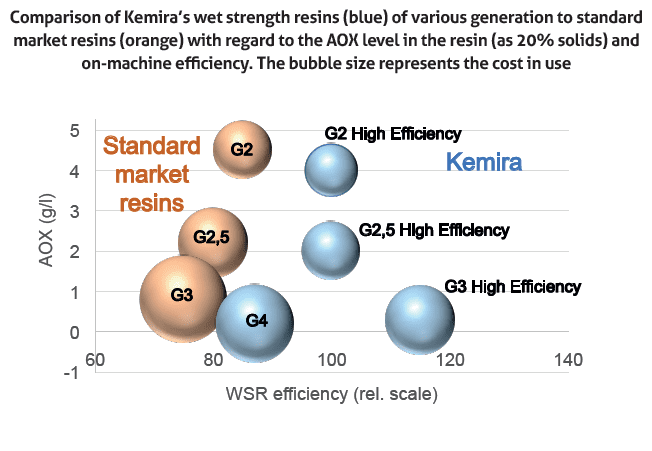 Various generations of standard market resins are compared to high-efficiency resins produced by Kemira in Figure 3. With standard market resins, the cleaner the resin, the lower its efficiency and, therefore, the higher dosages needed to reach wet strength targets. Higher WSR consumption, combined with already a high price of cleaner resins, make the cost-in-use increase significantly. However, the cleaner resins produced by Kemira according to the advanced manufacturing process, maintain their high efficiency. Therefore, the cost-in-use for G2.5 and G3 resins is significantly lower compared to equivalent market resins. Further reduction in WSR consumption can be achieved by using complimentary additives, referred to as functional promoters or WSR promoters. Kemira offers two types, anionic and cationic promoters, sold under the Kemira FennoBond® trade name. Anionic promoters provide the most benefits when high levels of WSR are used. WSR’s are high charge polymers and tend to overcationise fibres, resulting in decreased resin retention and its low efficiency. Besides overusage, unretained WSR can cycle up in the short loop, causing runnability issues such as excessive foaming, felt plugging and decreased dewatering. With the help of anionic FennoBond, fibre charge can be rebalanced, allowing for a more effective retention of WSR, thus improving the economics and keeping machine runnability under control. Lower dosage of WSR also means lower AOX levels in effluent. Another innovative solution for reducing WSR consumption is Kemira’s cationic functional promoter or cationic FennoBond. The chemistry of cationic FennoBond works through a different mechanism compared to anionic FennoBond. Cationic FennoBond polymer reacts with fibres and forms strong covalent bonds, contributing to both dry strength and wet strength development. Yet these bonds are hydrolysed in water, making the wet strength temporary, as shown in Figure 5. For many tissue and towel grades, permanency of wet strength is not required. Tissue products such as AfH towels, napkins or facial tissues are normally not used for longer than 10-20 sec, which is enough time for cationic FennoBond to provide the required wet strength. Tissue makers can use extra wet strength from cationic FennoBond to reduce the WSR dosage. With lower WSR consumption, lower AOX levels can be achieved as well as improved machine runnability. In addition, cationic FennoBond can boost dry strength, giving more flexibility to tissue makers in optimising their process parameters, especially refining. Less refining could provide opportunities for higher bulk, improved softness, less dust and enhanced dewatering. Thus, cationic FennoBond provides benefits of unique sheet characteristics, lower AOX and overall cost-savings. A towel producer has a tight control for the AOX level in paper, requiring a use of a standard G2.5 resin, which contributed to production cost. Reducing chemical cost was important for this machine. Kemira offered a new high-efficiency G2.5 FennoStrength. Figure 6 shows a trial summary. The machine trial showed 25% less resin was needed to maintain sheet quality and AOX targets. This resulted in more than 10% net savings. A towel manufacturer was using carboxymethylcellulose (CMC) to control fibre charge and provide dry tensile. CMC is an old technology for promoting WSR, which is effective yet with some drawbacks. The main issue is handling of CMC powder, which is associated with safety hazards such as dust and slippery floor around the make-down area. CMC was replaced with a synthetic anionic FennoBond that is supplied in a liquid form and only requires a pump to feed the chemical. Figure 7 summarises the results from an industrial trial. Anionic FennoBond was not only safer to use, but it resulted in an improved WSR efficiency. The wet tensile and dry tensile remained on target at 22% less WSR, generating 10% net savings. A manufacturer of napkins was looking for increased strength and refining energy savings. Cationic FennoBond was added after WSR, resulting in an almost immediate boost in both wet and dry tensile strength. Increased strength provided flexibility for optimising other process parameters. Refining was significantly reduced, generating energy savings. In addition, with less refining, dewatering improved and productivity increased. An increase in wet tensile strength gave an opportunity for decreasing WSR consumption by 13%. The net savings were estimated at over 90 k€/a. Even though the WSR efficiency or AOX were not the targets in this case, lower WSR dosage contributed to the overall savings and should also help lower AOX in effluent and paper. • Cationic FennoBond for partial substitution of WSR. Additional benefits from increasing WSR efficiency can be improved machine runnability and increased productivity. 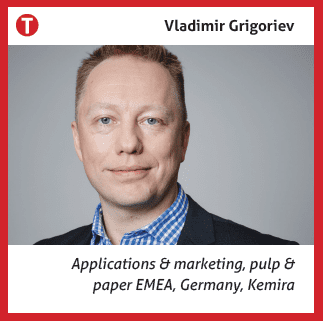 This article was written for TWM by Kemira’s Vladimir Grigoriev, applications and marketing, pulp and paper EMEA, Germany, and Eric Padovani, applications and marketing, pulp and paper EMEA, France. 1. Wet Strength Resins and Their Application, L.L. Chan, Ed. ; TAPPI Press, Atlanta 1994. 2. C. Campbell, H. Goldsberry, K. Wittich and F. Higa; Grade specific optimisation: Permanent (PAE) versus temporary (GPAM) wet strength utilisation; Tissue World magazine, September/October 2015. 3. M. Gorzynski, B. Nordqvist and J. Emanuelsson; Development of Environmentally Friendly Neutral Wet-Strength Agents, 1996 Papermakers Conference Proceedings, TAPPI. 4. Directive 2010/75/EU of the European Parliament and of the Council of 24 November 2010 on industrial emissions, published in Official Journal of the European Union, 30.9.2014, L284/116. Share the post "Meeting the WSR challenge head on"